MC Kats kneels and asks Fille to forgive him. 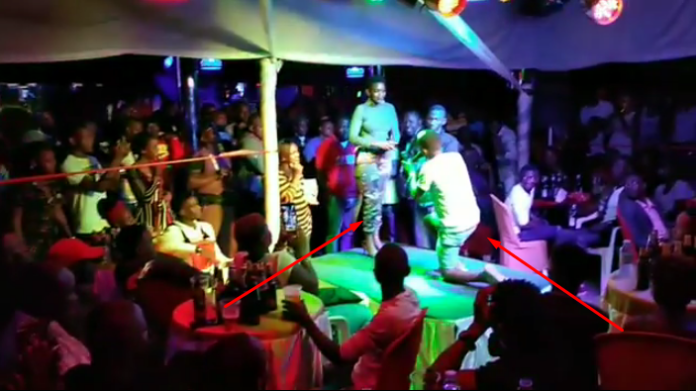 KAMPALA– City events MC who doubles as TV presenter Edwin Katamba commonly known as MC Kats over the weekend knelt down and asked Singer and wife Fille Mutoni to forgive him for his reckless behaviors. The master of ceremonies and his baby mama have always had fights breakups on allegations that Kats is a super cheat. In a video, the TV personality did not deny, but rather went on his knees and asked for forgiveness and promised never to behave the same. “On my knees Fille, I know we have come far and I have wronged you severally but please forgive me,” begged Kats. Last month, Mc Kats announced dumping of musician for a new catch revealed as Shadia. It is said that on that weekend, Fille had traveled to Gulu for a music show and MC Kats was in Hoima with one Shadia for the Purple Party tour hosted by Douglas Lwanga. A friend to Fille who was on the same party in Hoima called and fed her with information about the husband and a one Shadia. It was the same day when the Mc took to his Instagram and posted a photo with Shadia and her friends praising her company. The couple is said to have had a nasty fight over the issue.